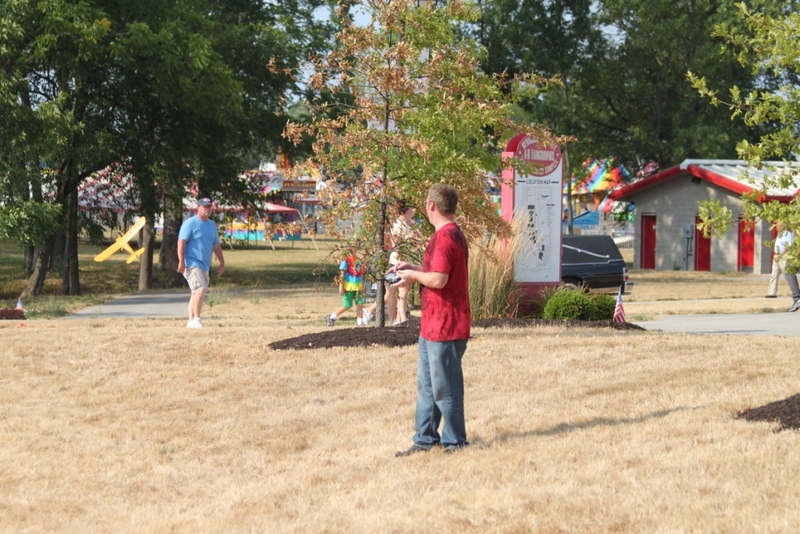 Sunday July 15th, opening day of the 2012 Hendricks County Fair. Another really, really hot one! We had some shade and plenty of water, also seen a lot of empty lemon shake up cups around. 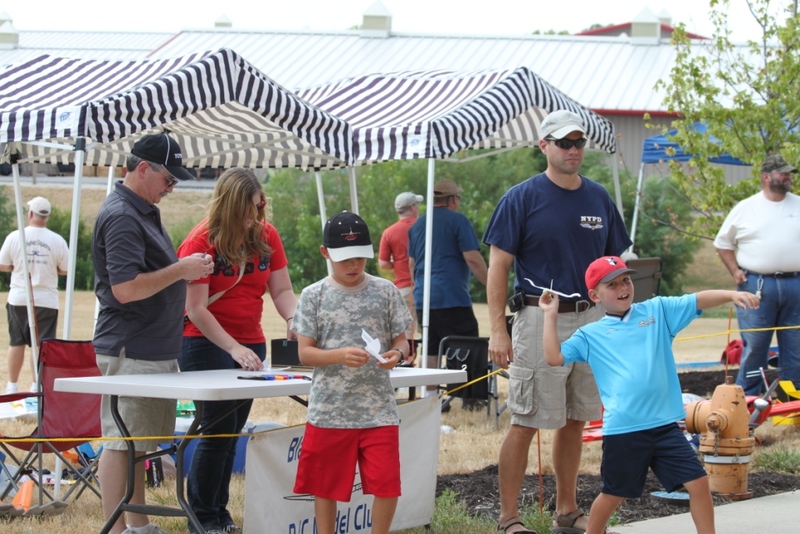 We did something new this year, Jay downloaded a copy of the FPG-9 plans and we manned a table for youngsters to build one and fly them. Rege cut over a hundred and all the kids had to do was decorate them and tape them together. 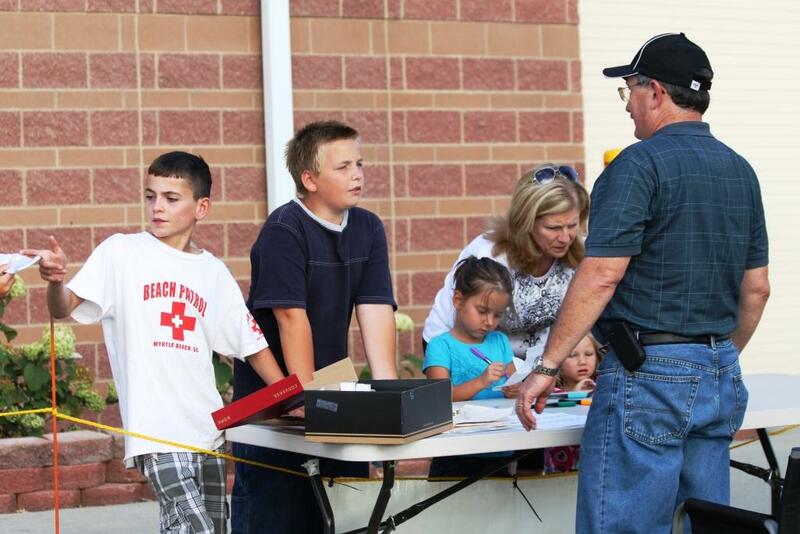 It went over well as we helped out with more than 80 being passed out. Tom and Kim Carlyle manned the table most of the evening, Thanks. a really big THANK YOU to Tony and Rege for getting the pop-up's , tables, chairs and ice chests to the fair and to every Blacksheep member who was able to bear the heat and participate. 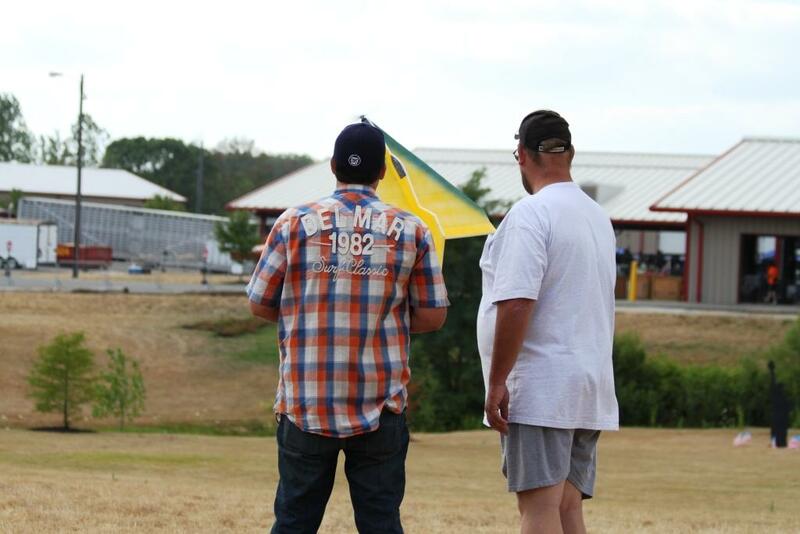 Thaks to those who participated: Ralph McBee, Dillon McBee, Rege Hall, Parker Hall, Dave Miller, Ray Courtney, Al Hill, Drew McBee, Tony Bowling, Tom Hatfield, Tom Hatfield, Tom Carlyle, Kim Carlyle, Bryan Baumer, Wyatt Hartsock, Justin Hartsock and Curtis Prater. 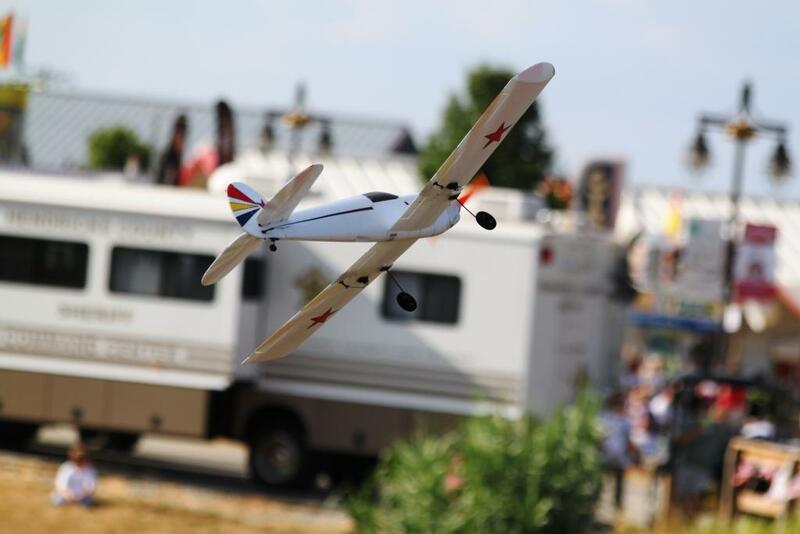 As you can see from some of the photos below, lots of cool planes, helicopters and lots of flying. It was like being at an electric fun fly. 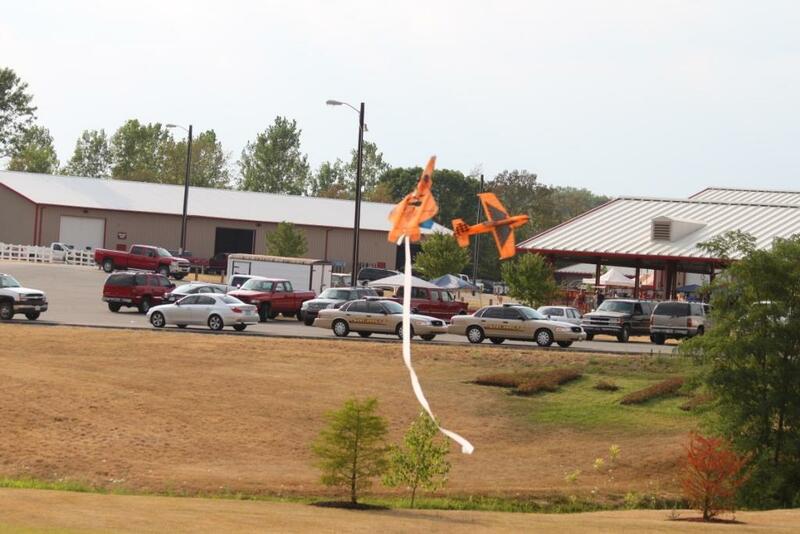 The entertainment alone from the F-22 and Raven flights chasing the ribbons was worth the price of admission. 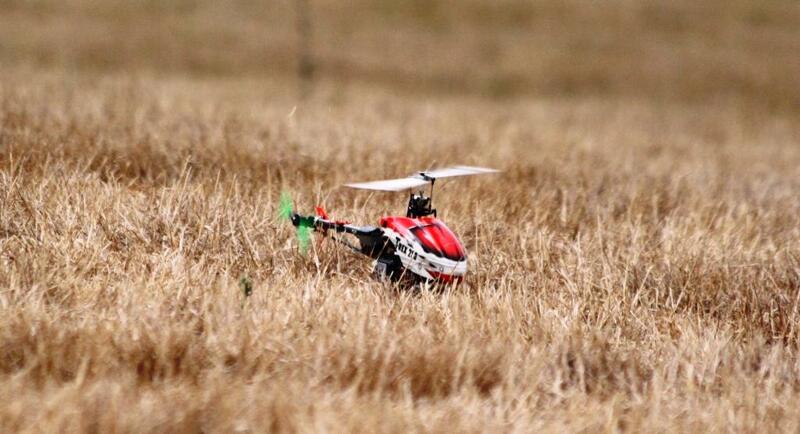 Parker put on a nice demos with a 90 sized Whiplash electric heli. 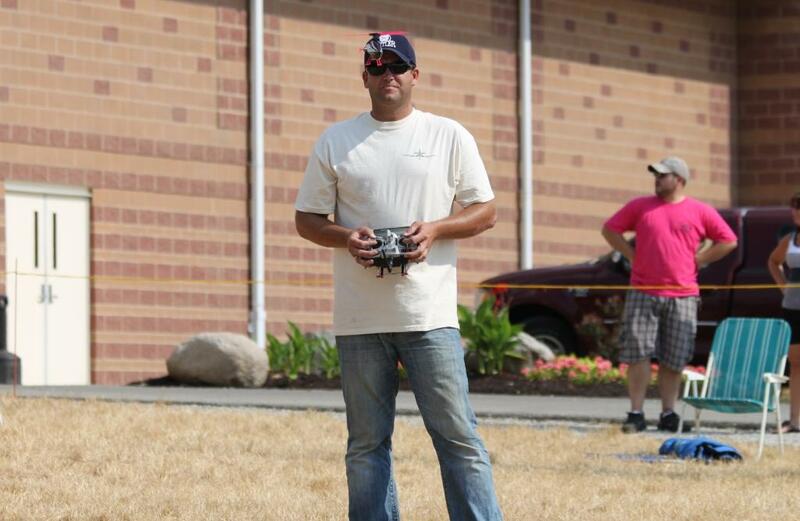 Dillon and Ray flew many nice demos with their MCX-P helis. Same song, second verse, Friday the 20th Blacksheep at the Hendricks County Fair. Supporting cast for this show was: Rege Hall, Parker Hall, Dillon McBee, Ralph McBee, Tony Bowling, Don Trosper, Al Hill, Bob Wernsing, Justin Hartsock, Jay Thomas, Tom Carlyle, Dave Miller, Ray Courtney, Matt Shelton, John Lawyer and Curtis Prater. 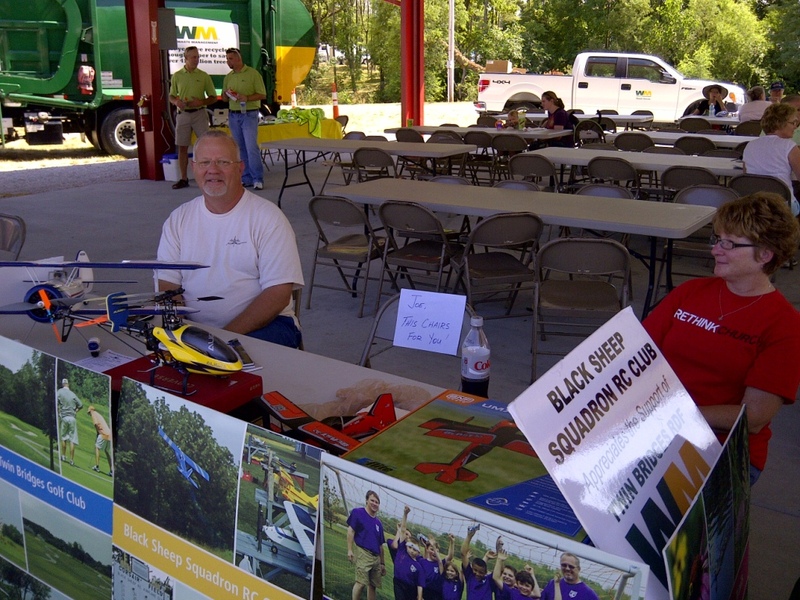 Tom Carlyle and Jay Thomas helped youngsters build and fly the FPG-9 gliders. I think we built around 150 all together, it was a big hit. The ribbon chase was again exciting, see the video below. 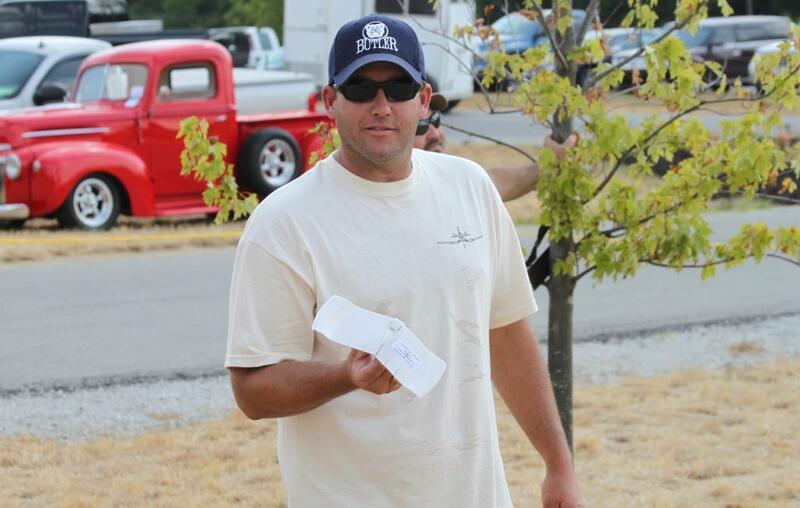 Matt flew right into the tail of the ribbon and had o land form all the crape paper chewed up. Dillon landed on the ribbon and touched it several times. 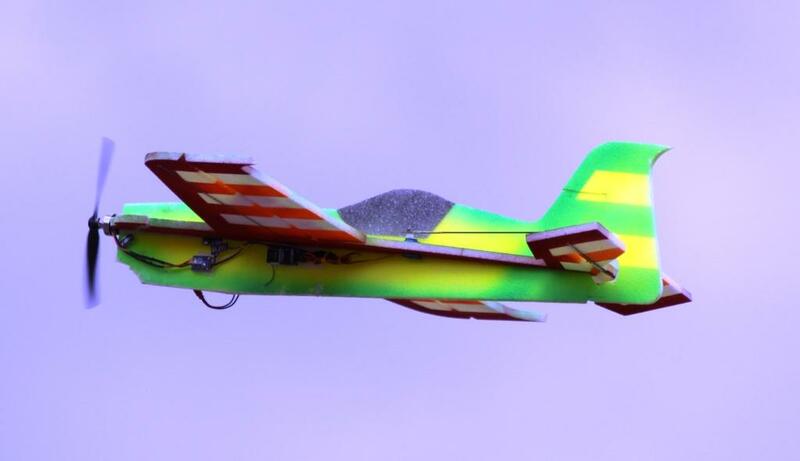 Parker flew several demos again with the Whilash electric. One flight was from the opposite side because of the sun, man what a site. 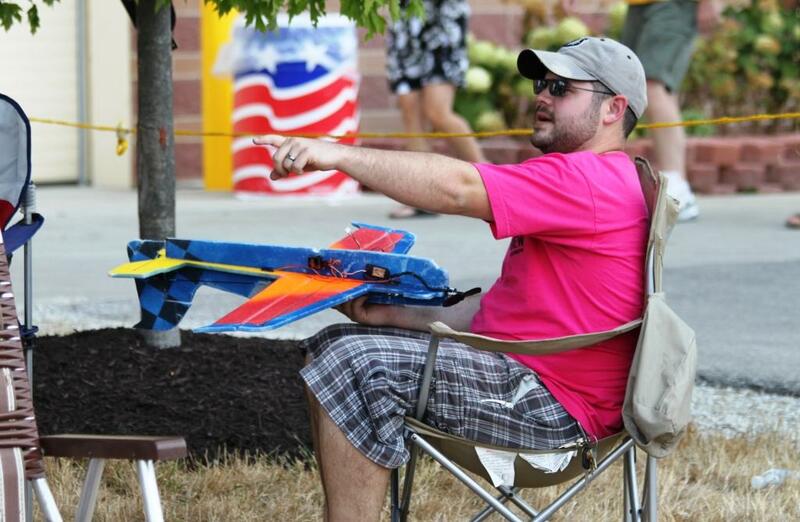 Justin Hartsock with his flat Yak 55. 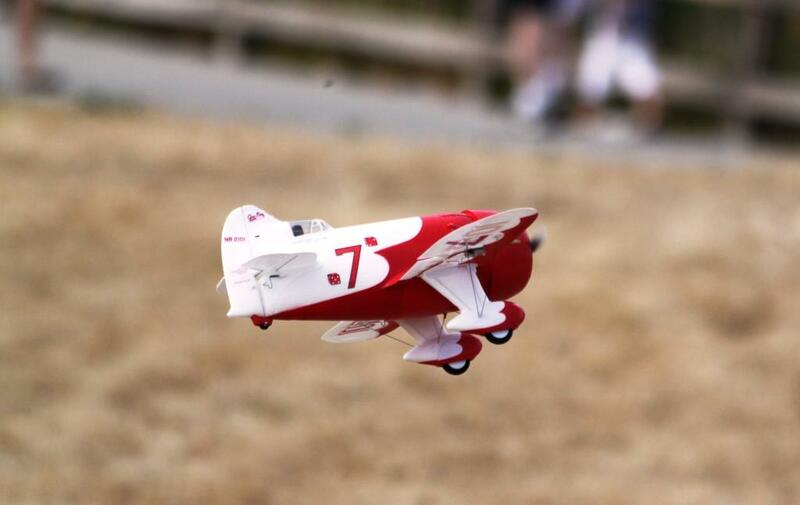 Matt Shelton with his Ralph's Custom Models Yak 55 foamie getting in some low hovering. Al Hill bringing his Fancy Foam Freestyle in close. A close in shot of Dave Miller's flat Raven, still bright after all those flights. 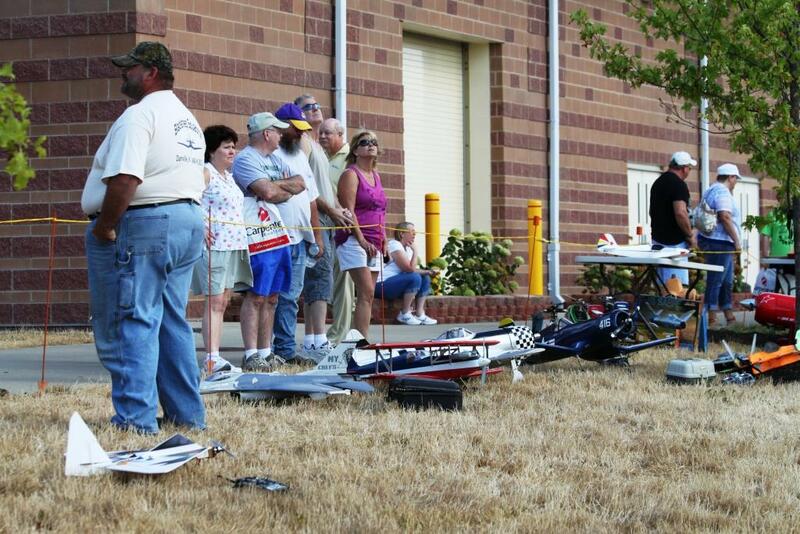 Jay Thomas talking rc with a group of fair goers about Rege Hall's 100" wing span Hangar 9 Sukhoi SU-31. 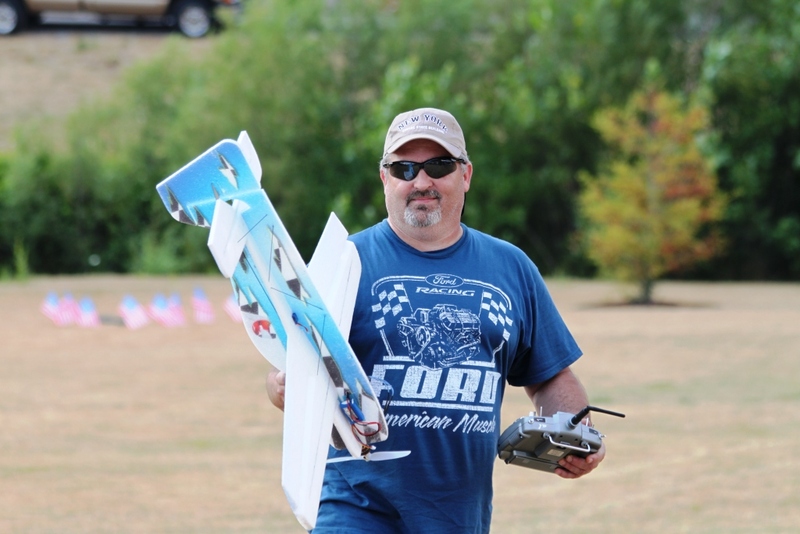 John Lawyer launching his Zip1 triangle wing plane. 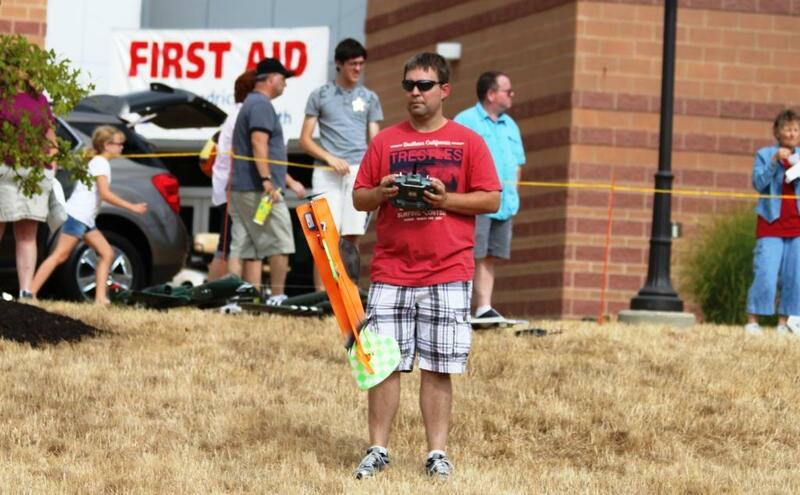 Justin Hartsock flying his T-Rex 250. Justin's T-Rex 250 just settling in. 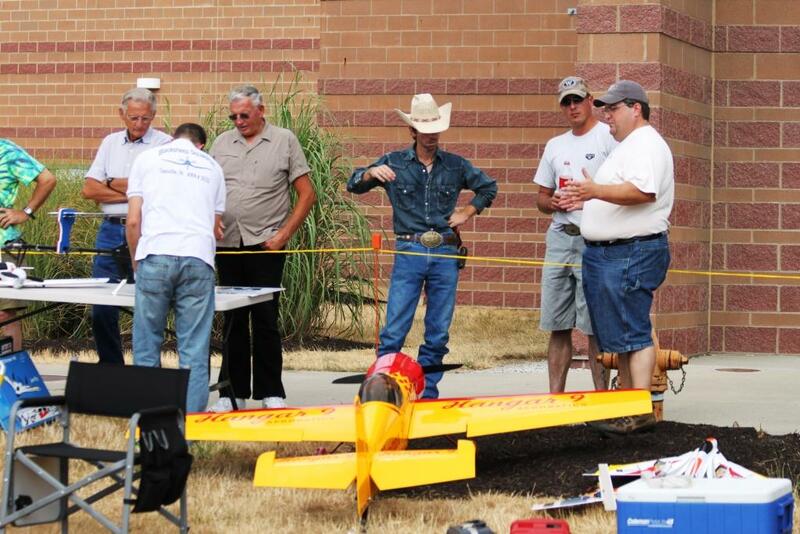 Ray Courtney and Bob Wernsing with Bob's new Ledfeather 3D delta wing design. 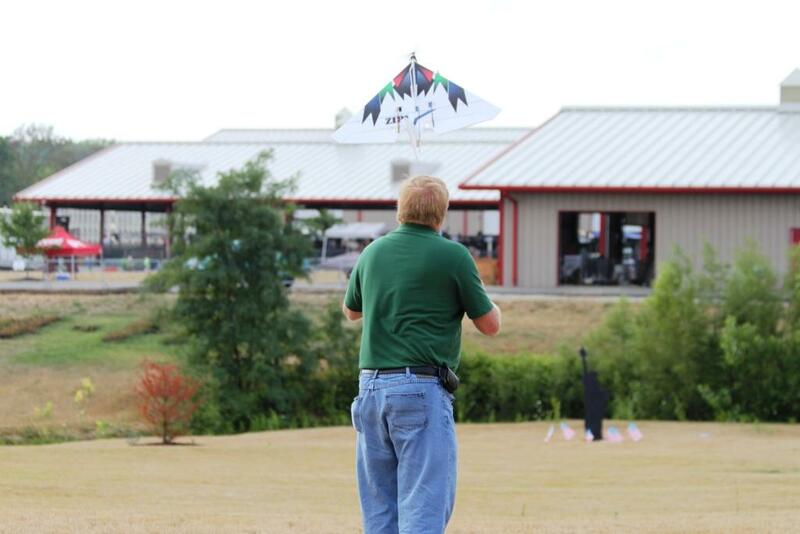 Dillon McBee launching his newly repaired F-22. 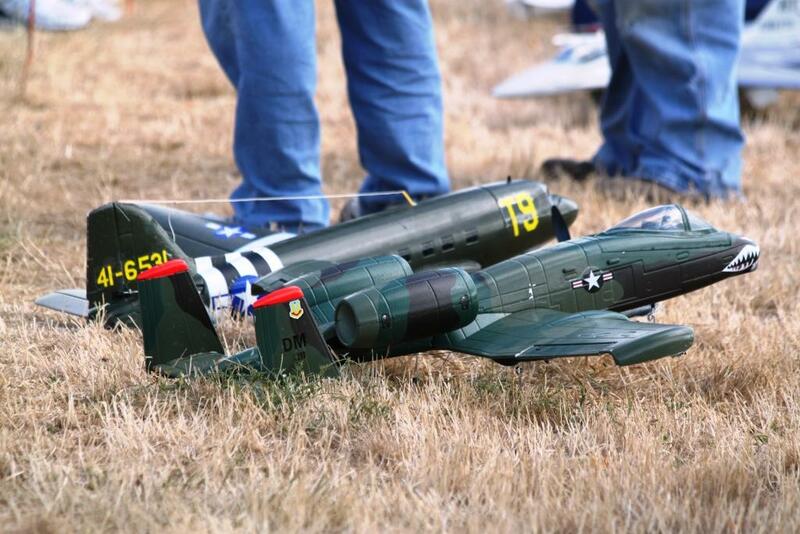 John Lawyer's electric A-10 Warthog and C-47. 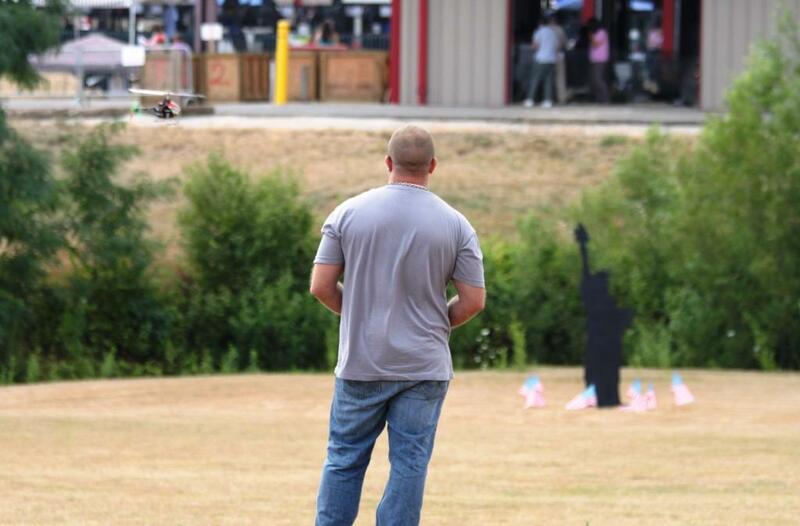 Curtis Prater watching the north flight line and talking rc with fair goers. 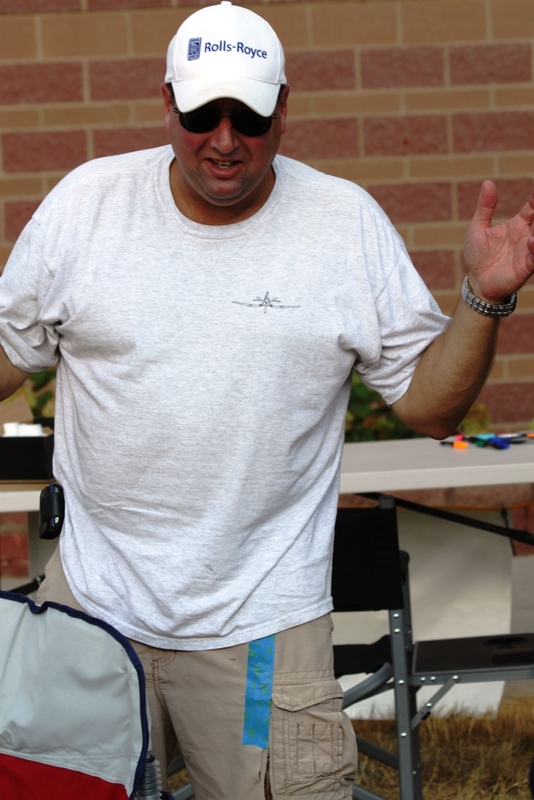 Dave Miller demonstrating the best of fair food. Parker Hall's Super Sportster, gearless. 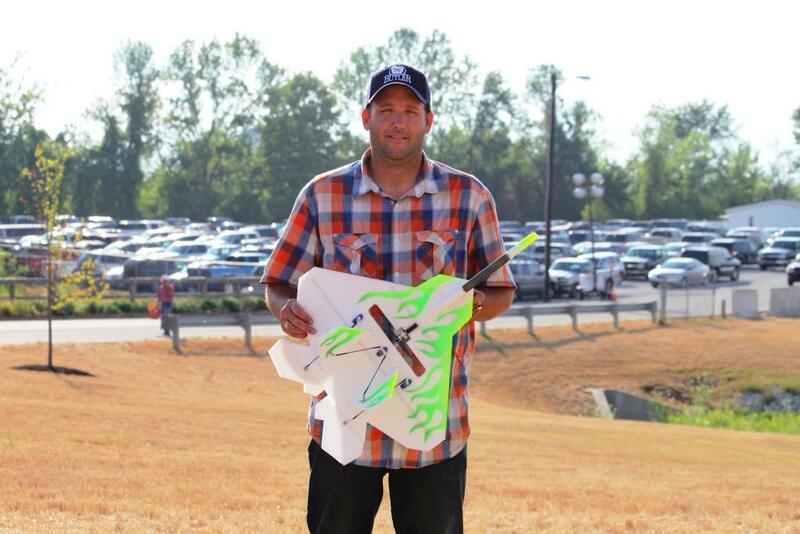 Ray Courtney with his new Ralph's Custom Models F-22 I a cool flame scheme. The guys seemed amused at Rege Hall's use if duck tape to make a wardrobe repairs. Parker Hall, with Ray Courtney spotting, caught in a low, fast funnel with the electric Whiplash. Ah, the great, grand, glorious guards of the Blacksheep. Tom Carlyle helping one of the very many youngsters build a FPG-9. He manned that table all night. Dave Miller and Jaymee Hall at the table on Tuesday in support of Waste Management as they are the sponsor of the day at the fair. 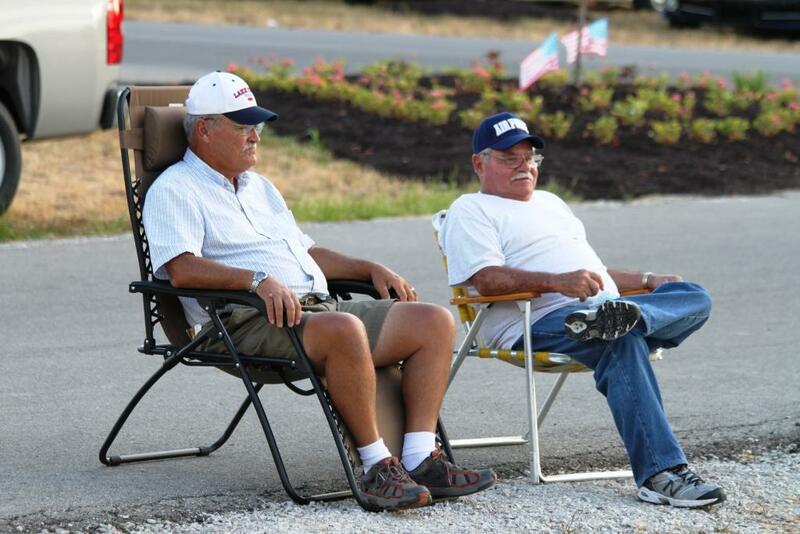 Joe Kosiba's missing man chair in the middle. Man, it was a hot one. 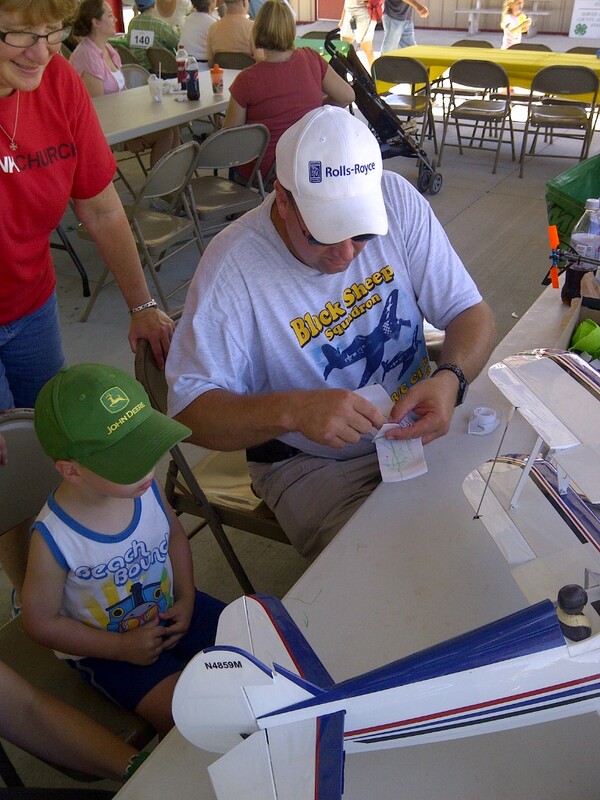 Rege Hall helping a young fair goer build a FPG-9 glider. We built many again on Tuesday. 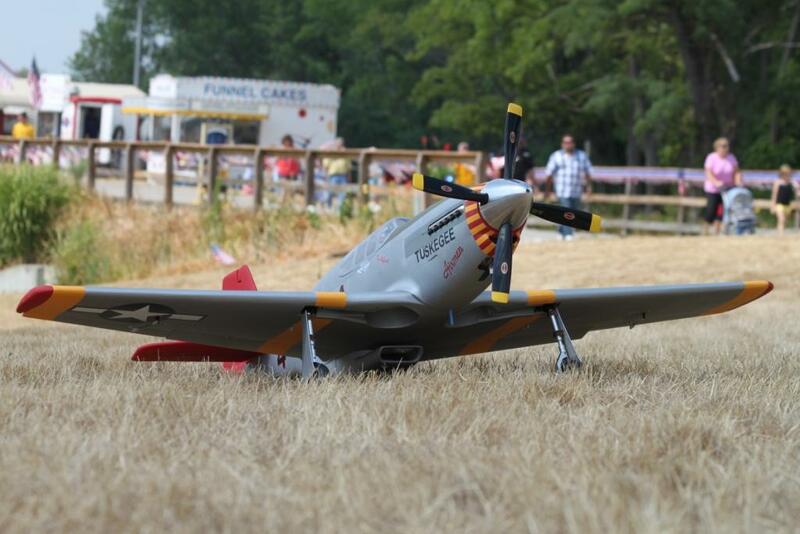 Bryan Baumer's ESM P-51B Mustang. 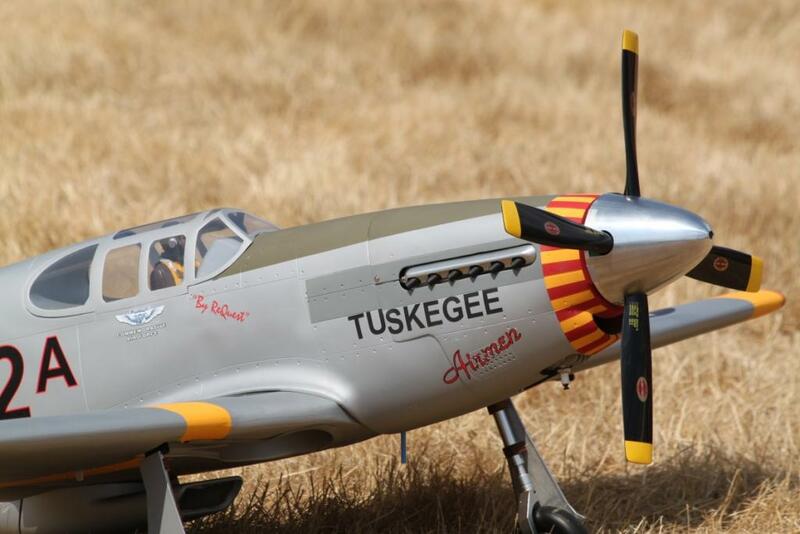 Done in the Commemorative Air Force's Tuskegee Airman scheme as flown by Doug Rozendall. Another shot of Bryan's Mustang, very nice and the scale exhausts from Keleo Creations and the flying 4 blade prop make this a special effort. Powered by a DEL 30. 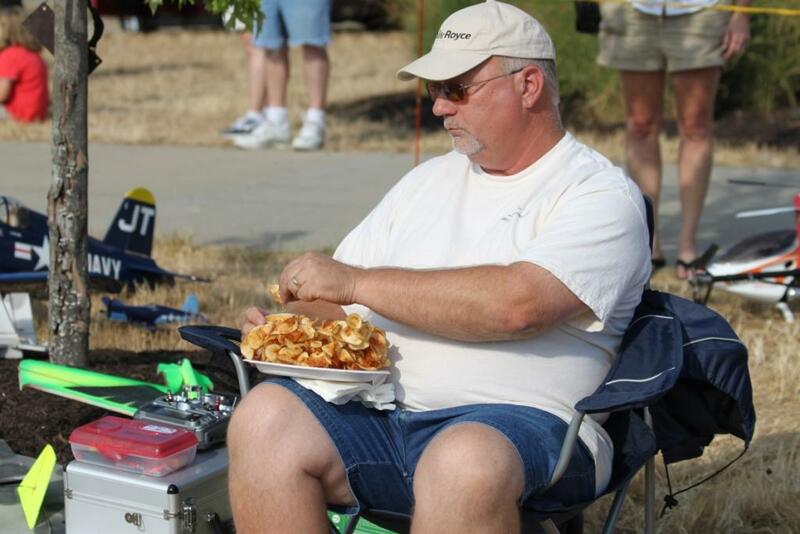 Ralph McBee with his cool paint job F-22 on the way back from a mission. 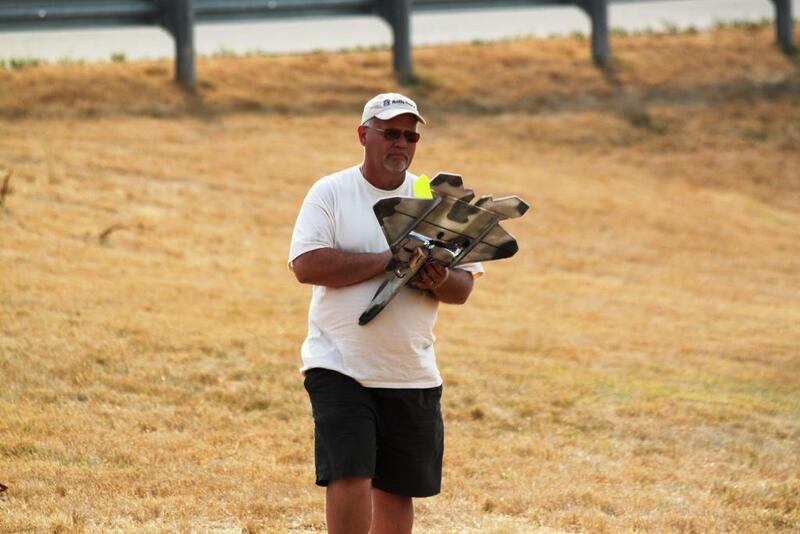 Ray Courtney with his FPG-9 glider. I think this will make a neat winter meeting program. Drew McBain repairing his falt foamie Raven. 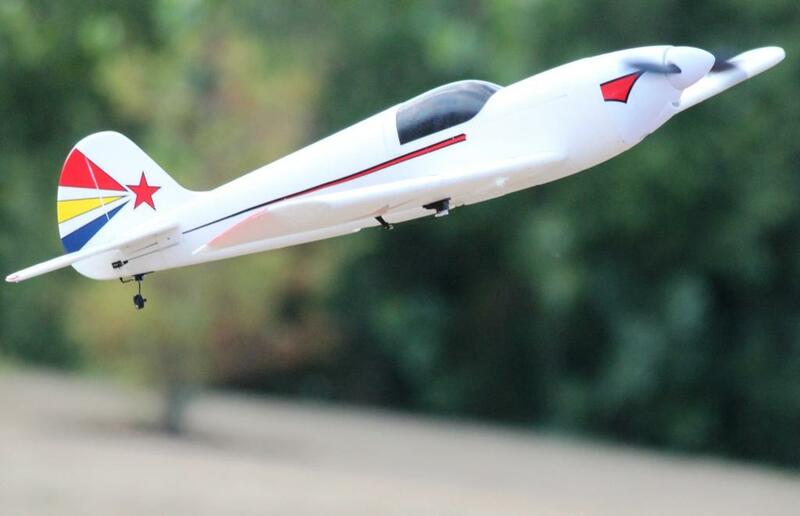 Tom Hatfield and Tom Hatfield getting their 71" wing span Yak SP55M ready to display. This is a very plane with all the goodies on it. 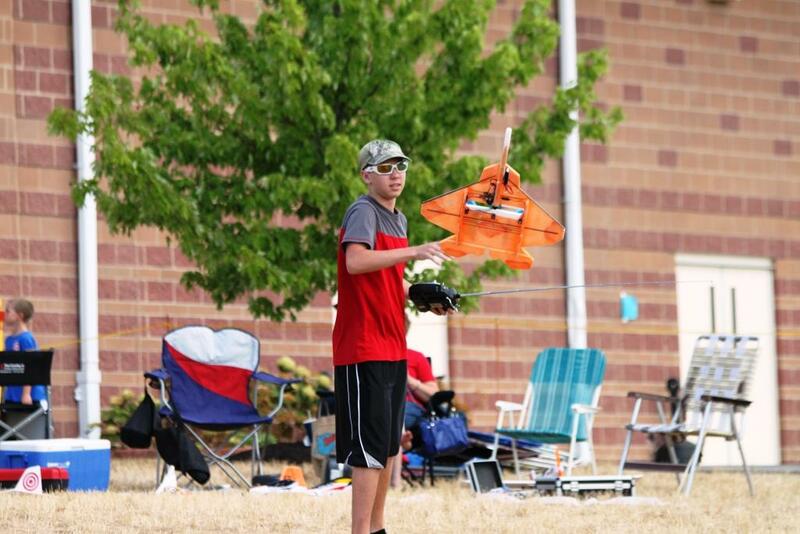 A youngster flying his newly crafted FPG-9. Again, this went over well. We used Blacksheep address labels with our web address on it to hold the penny down. 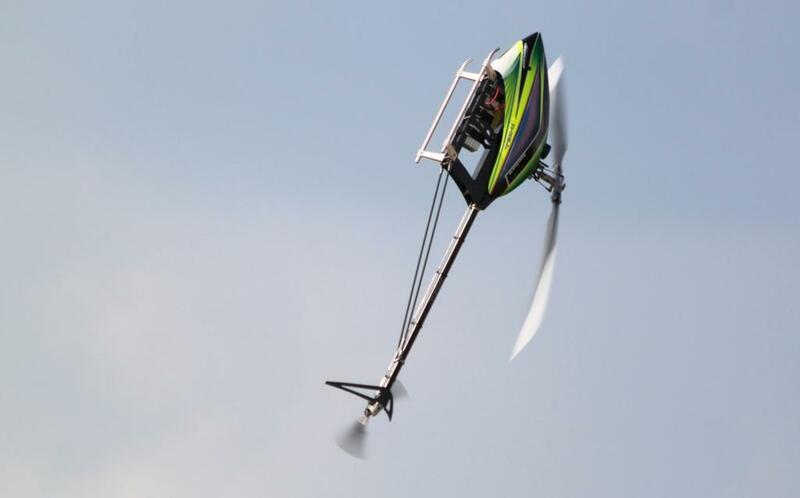 Ray Courtney hovering his MXCP flybarless helicopter. 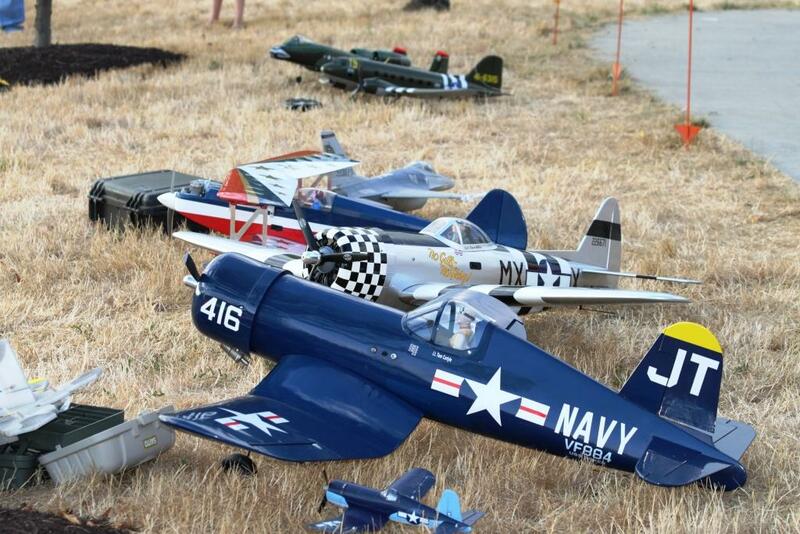 Tom Carlyle's Corsairs. 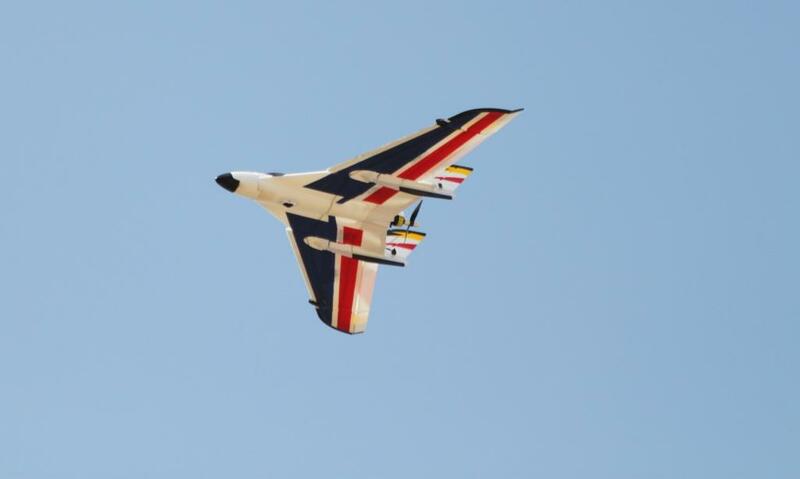 The big one is a Hangar 9 powered by a Saito 1.00. 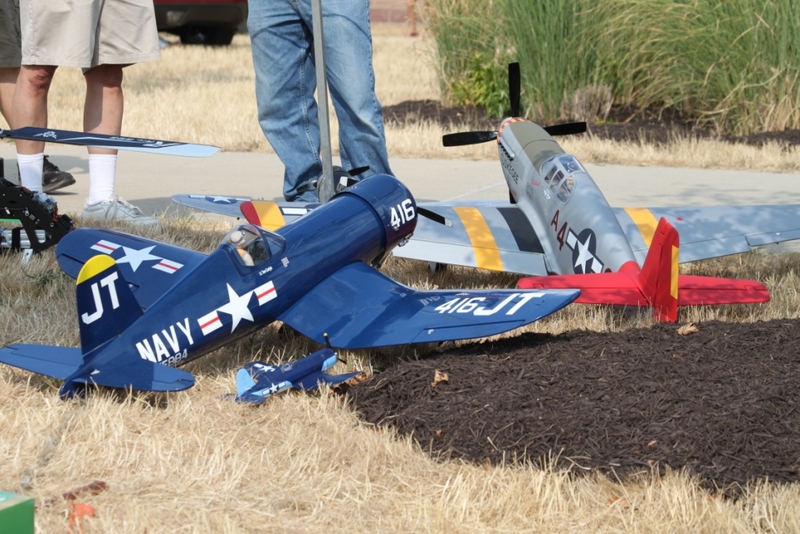 The small one is the micro Corsair he won at the 2012 Warbird Fly In. 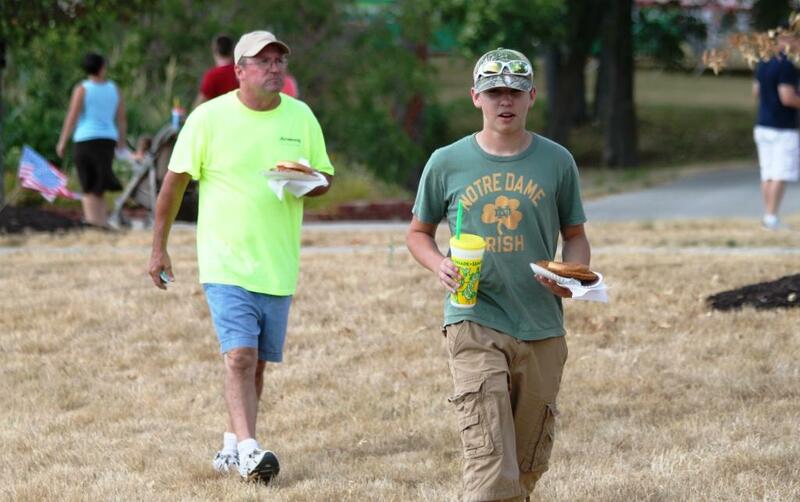 Ah, fair Food! Ralph and Dillon enjoying this special time of year. 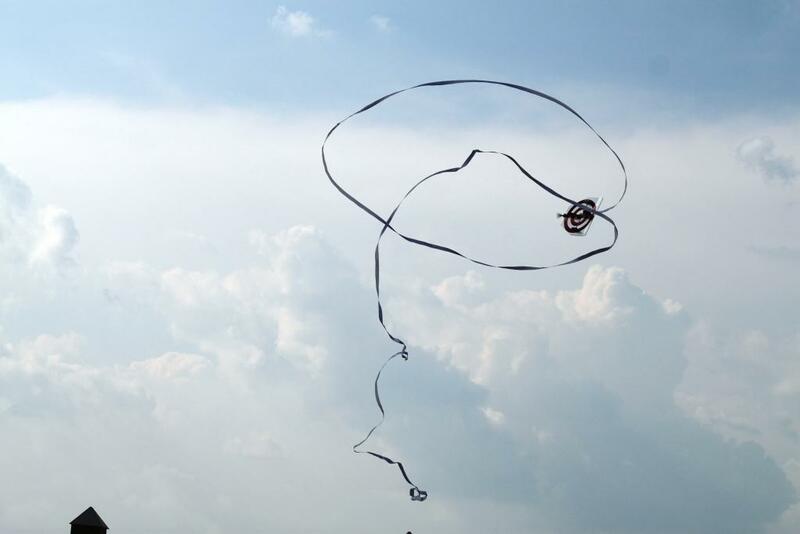 Drew McBain's flat foamie Raven climbing for the skies. This plane got a lot of flights in. 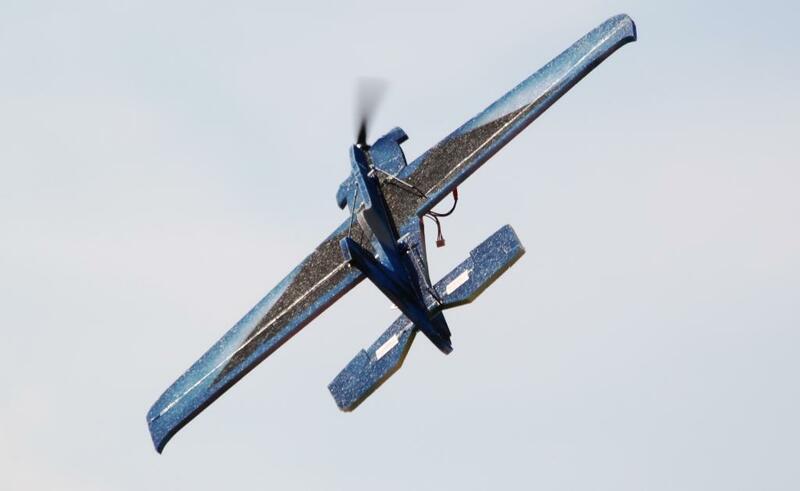 Bryan Baumer's Raven on a low sweeping pass, trying to sneal up on the ribbon. It is cool to fly below your feet level. Brian's Raven cutting in front of Drew's Raven. John Louden's Stryker elevatoring down. 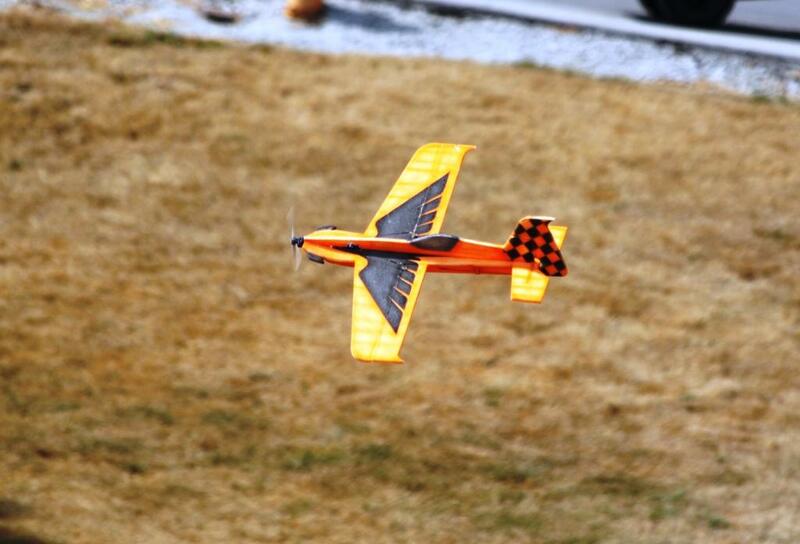 Parker Hall flying the MA Whiplash electric, look at those blades working. Rege Hall's target tug getting ready to cut it's own ribbon afer Dillon, Bryan and Ray all got the ribbon. 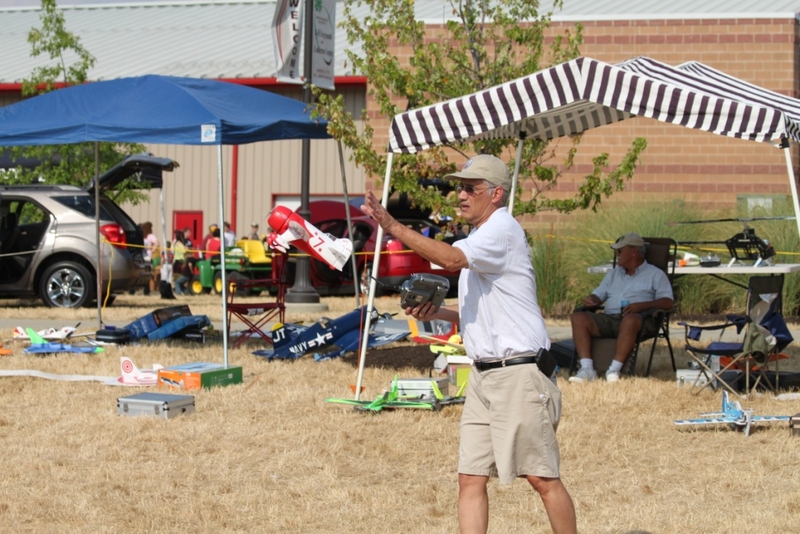 John Louden showing the fine art of hand launching his micro Gee Bee. 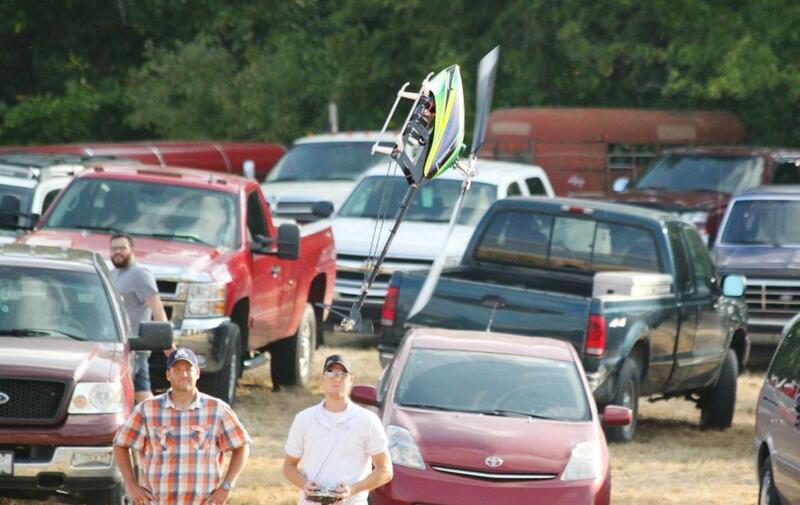 Tom Hatfield flying a micro Champ, it handled the wind well. 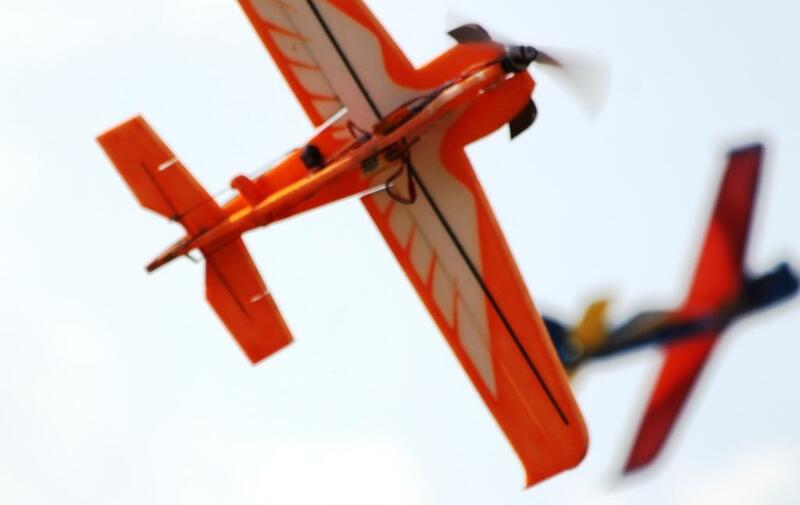 John's Gee Bee making a pass. 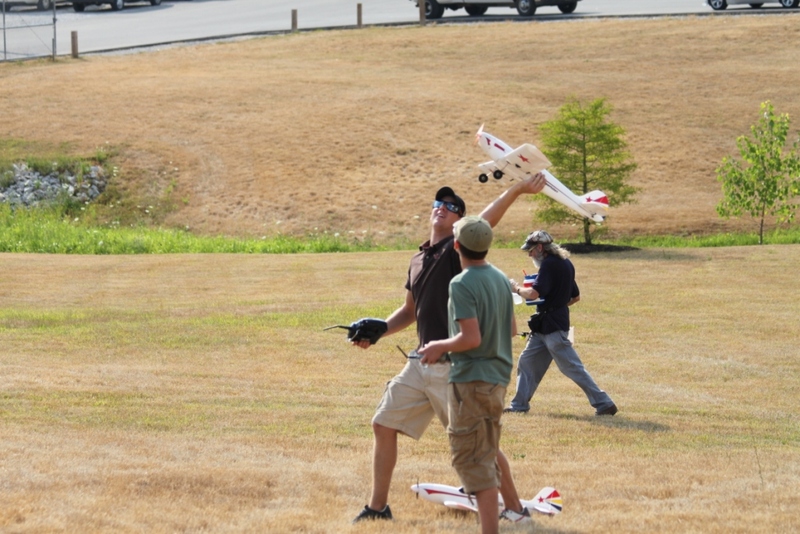 Parker Hall hand launching his Sportster electric as Dillon is getting ready to take to the air. 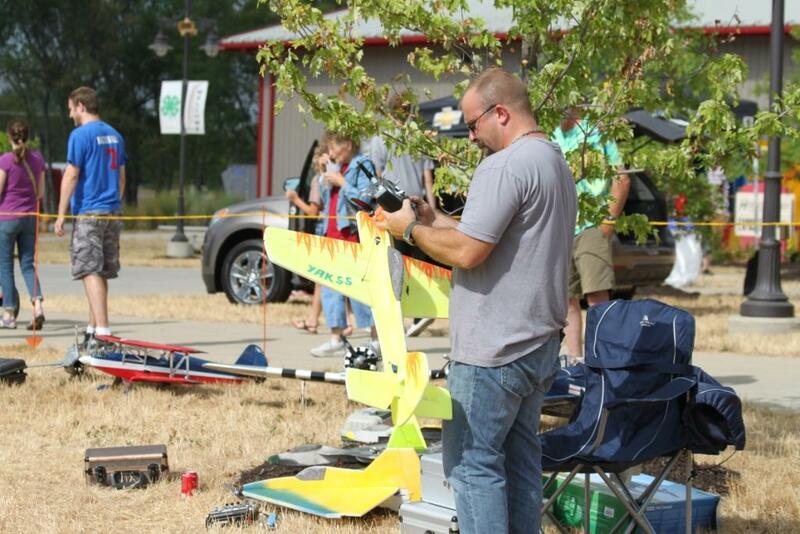 Dillon flying his F-22 towing the ribbon he cut from the target tub. 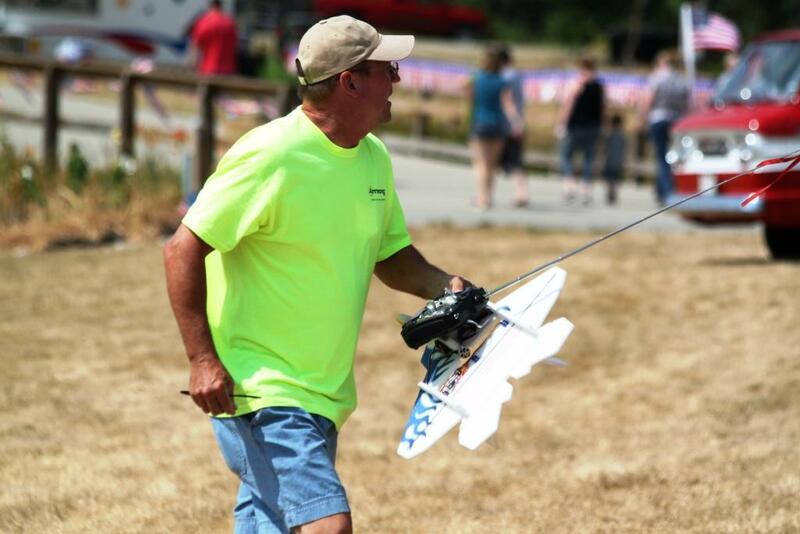 Dave Miller retrieving his F-22 from another successful flight. Al Hill's Fancy Foam Freestyle foamie. 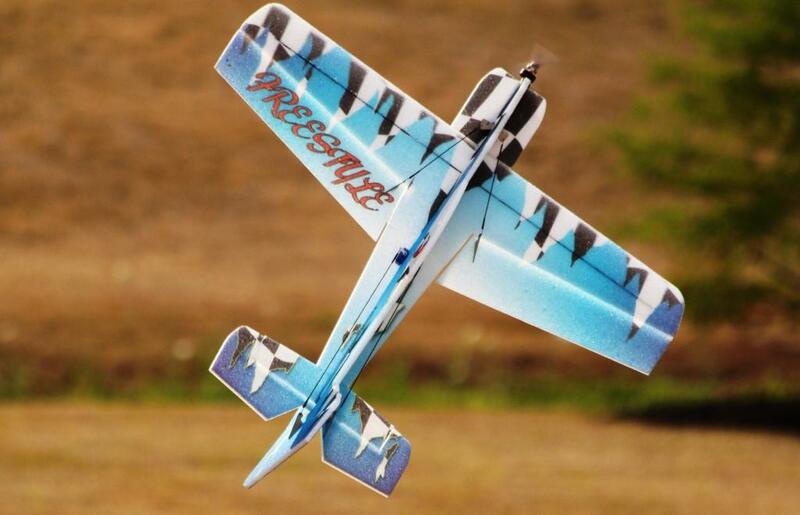 Airfoiled wings make it a little more aerobatic. Al on his way back to the pit area. 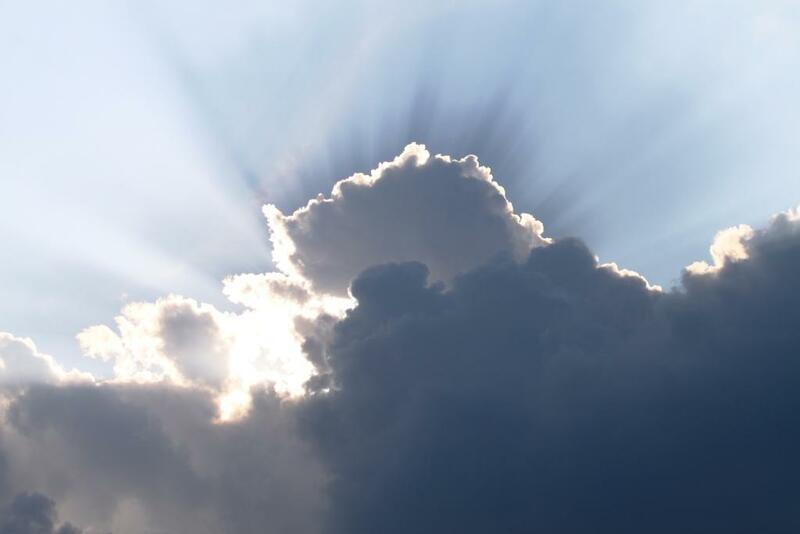 A shot of the cool sun rays late into our performance. 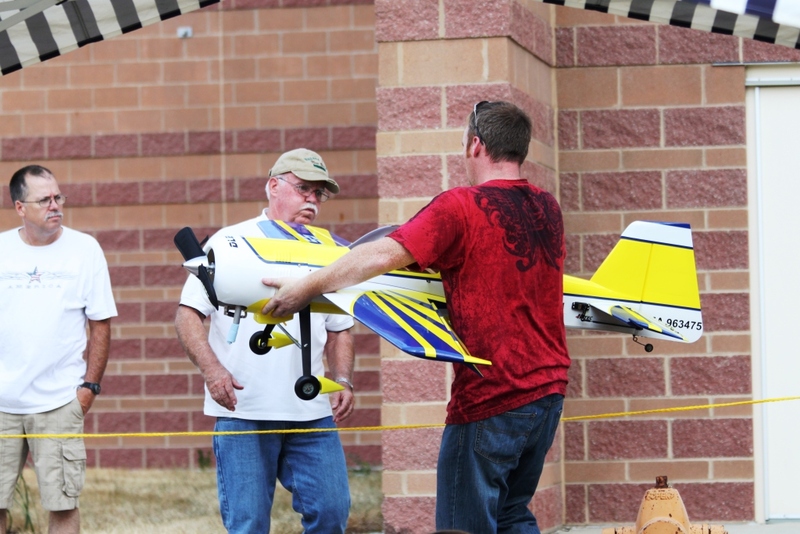 One of Parker's demo flights. Ribbon chase. 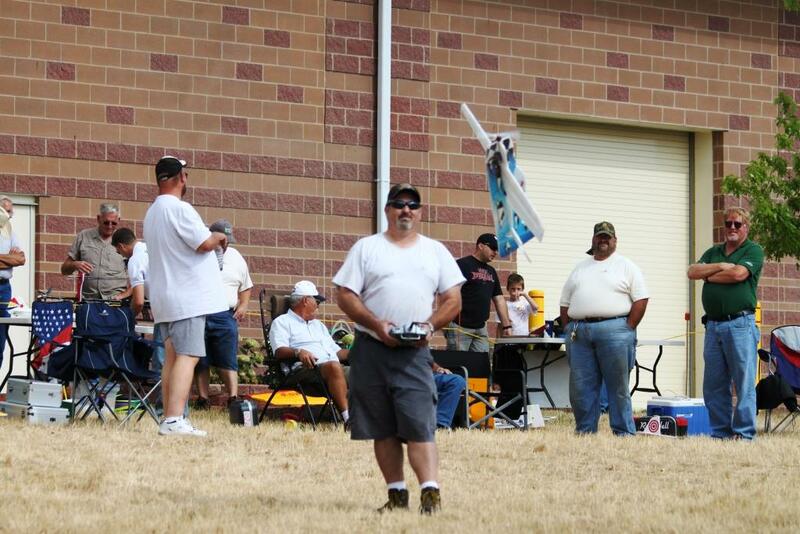 Rege Hall flying the target/ tow plane with Dillon McBee, Matt Shelton, Dave miller and John Lawyer chasing.